On Day 3, Let's see some more Kerberos attacks which can be used to bypass ATA. Also, since we already escalated to DA on Day 2, we will also discuss attacks across domain trusts which are not detected by ATA. Constrained delegation allows access to a service by impersonating *any* user if the service account is configured so (msds-allowedtodelegateto). You can read more about this attack here, here and here. All of the three are fantastic posts, please go through them to understand the attack. ATA doesn't detect this attack.Why? Read on. 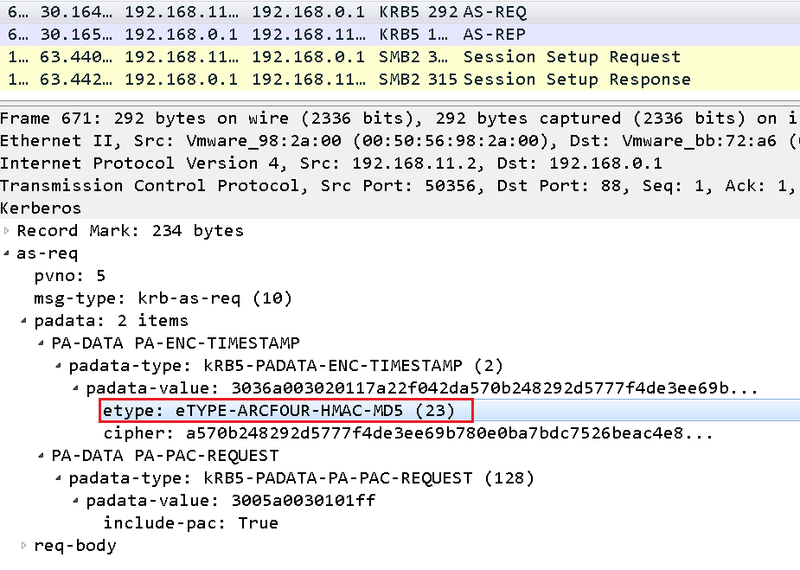 Encryption type 0x17 means RC4-HMAC. See this article. Now, is 0x17 an anomaly? 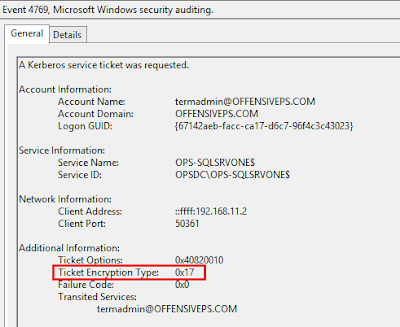 Not really, even though AES has been introduced since Server 2008, service accounts, inter-domain tickets and inter-forest tickets still use RC4 encryption. So there is no downgrade for ATA to detect, by default, as far as TGS_REQ is concerned. Even if we force enable AES on the service account ATA doesn't detect it as we need to move the entire domain (trusts, legacy machines etc. still use RC4) to AES before 0x17 can be considered anomaly. I think there is one chance of detection, while requesting a TGT, there is an encryption downgrade for the AS-REQ packet (see the screenshot above). But it is up-to the ATA team to tune-it and make the detection reliable. Also, there is no detection for alternate tickets. It is possible to access any service running with the same service account as the service for which constrained delegation is enabled. 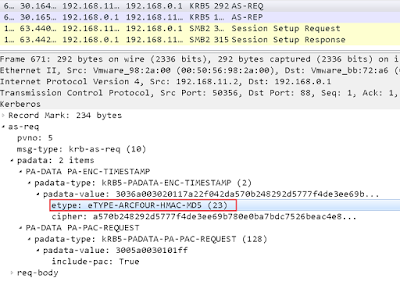 See the section, "Server SPN target name validation level" in this article. That means, if we have access to a service like time on the domain controller using constrained delgeation we can request a TGS for a service like HOST (Schedule tasks and many others), RPCSS (WMI), CIFS (File server) and take over the DC completely and ATA won't detect it. But please keep in mind that if we access the LDAP service and try to run DCSync attack (replication), ATA will detect it. In fact, during my testing, I found out that DCSync is one of those attacks which ATA rarely misses. The ATA team commented that they are "currently working on detecting abnormal delegation usage". Let's discuss couple of attacks across domain trusts. Many attacks across domain trusts are not detected. That inter-domain tickets use RC4 is one of the reasons for this. We will discuss only two of most interesting attacks, escalation from domain to forest root and DCSync (replication) without detection. It is well known that if we have DA access to one of the domains of a forest, it is possible to escalate privileges to the enterprise admin of the forest root. Read Sean's blog post here to understand the attack. To use this attack, we just need the krbtgt hash of the current domain and some other information (domain SID, parent domain SID etc.) which is available to any normal user in active directory. We forge an inter-domain TGT, sign and encrypt with the krbtgt hash of child for validation and append SID history. When the parent DC receives this TGT for accessing a service in the parent domain, it reads the SID history and if it is set to Enterprise Admins, we are granted that privilege. ATA currently does not take into account if AES is enabled for a trust. As I stated earlier, DCSync is rarely missed by ATA. But if it is done from a chilld domain controller, DCSync is not detected by ATA which makes sense as domain controllers replicate stuff all the time. Since we escalated to Enterprise Admin above, we have sufficient privileges to do so. This makes it much easier to laterally move in the parent domain as we can extract AES keys and avoid detection later. That is all for Day 3! I recommend you to view here reverse cell phone lookup and you gonna learn a lot. Ex client work and i appreciate your information about the Social Engineering it's a good work.